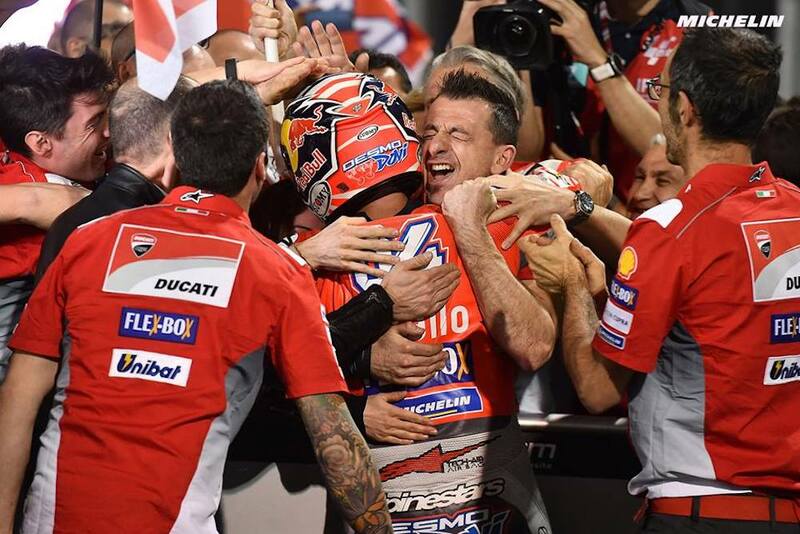 Ducati's Andrea Dovizioso put on a masterful performance during today's MotoGP Grand Prix of Qatar, in which his fine-balancing of aggressiveness, patience, and raw skill earned him the top step of the podium at the season's opening race. The wheelin' Italian made a good start from fifth position on the grid, but others around him seemed to come to terms with their Michelin tires sooner rather than later, which made his charge to the front take longer than expected. Pole-sitter Johann Zarco maintained the lead from the start, and surprisingly had enough pace to hold back a charging Dani Pedrosa and Marc Marquez during the opening stages of the race. Eventually, it became a three-horse race with Zarco, Marquez, and Rossi separating from the rest of the field. It wasn't until lap 17 of 22 that Dovizioso got past Rossi and began his charge to the front of the pack. "Dovi," as most call him, showed off his Ducati's robust horsepower as he managed to squeeze by Marquez and Zarco at the end of the main straightaway to claim the lead of the race, which he clung to until the end. Of course, with Marc Marquez right behind him, it wasn't necessarily a Sunday ride for the Italian. Marquez, as usual, began increasing the amount of pressure as the last three laps of the race unfolded, but waited until the very last one to pull the trigger. It all came down to the final corner of the final lap, when Marquez tried to cut his way on the inside but ended up carrying too much speed and not being able to pull off the delicate maneuver. 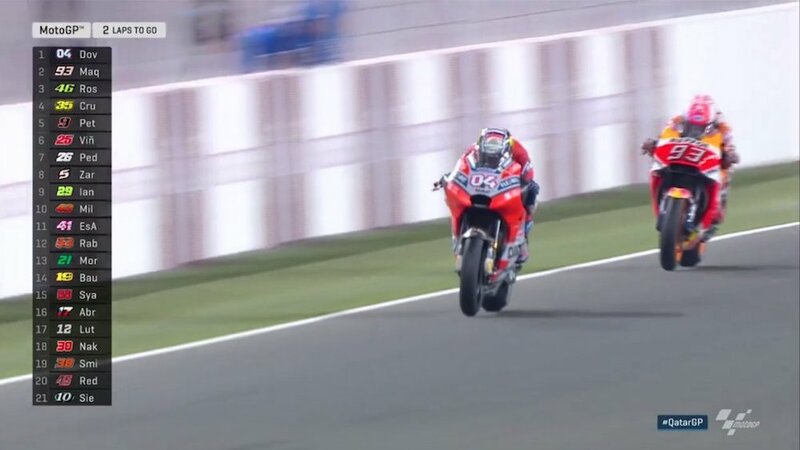 Dovizioso and Marquez emerged from the corner side by side but the Ducati managed to accelerate faster than the Honda. 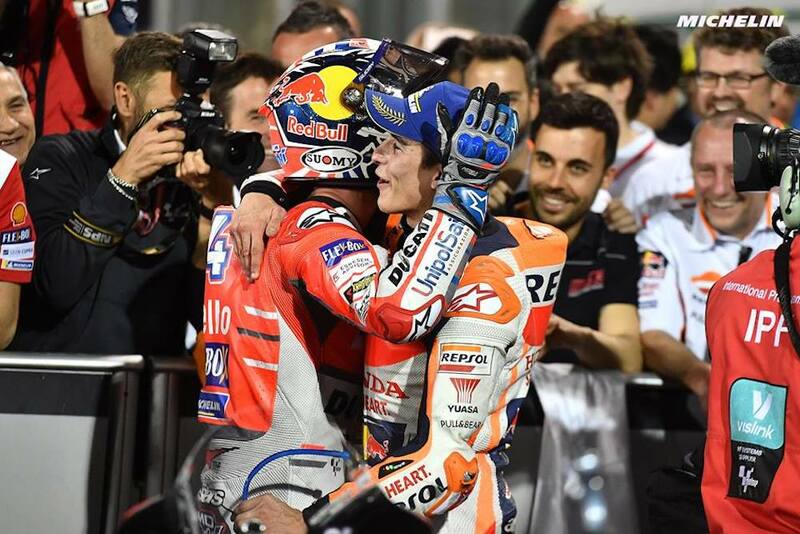 In the end, Marquez crossed the line a ridiculous 0.027 seconds behind Dovizioso, with Valentino Rossi nearly eight-tenths of a second behind the Spaniard. 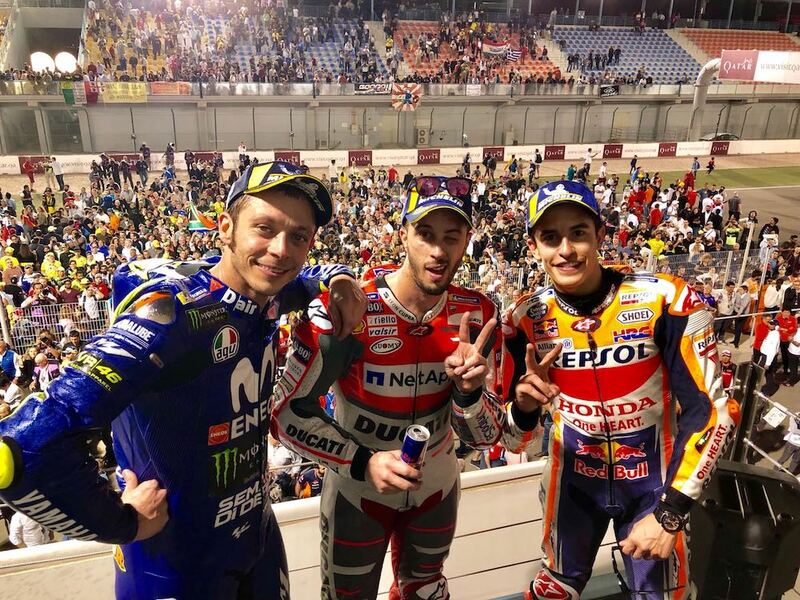 A Dovizioso, Marquez, and Rossi podium for the season-opening race proves that the 2018 MotoGP season will simply be an outstanding one. The Frenchman beat Jorge Lorenzo's previous MotoGP track record on his way to the front of the grid. The track was artificially soaked to weigh the possibilities of holding a future night race in the rain.